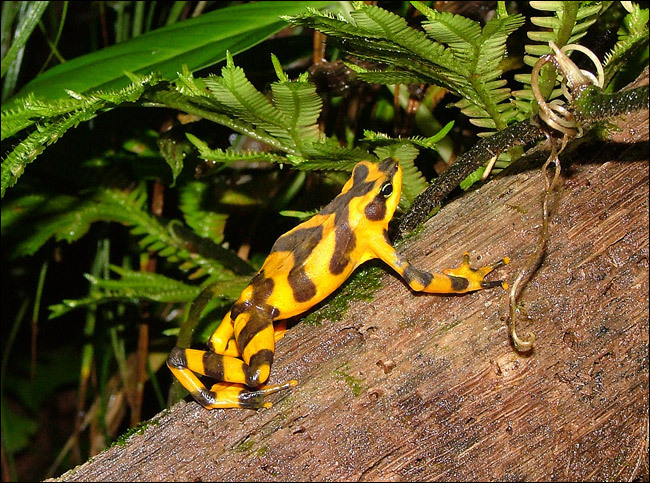 About two-thirds of over 110 species of brightly colored harlequin frogs, in the genus Atelopus, in the American tropics, have vanished since the 1980's. Scientists studying a fast-dwindling genus of colorful frogs in Central and South America say that recent global warming has combined with a spreading fungus to create a killing zone, driving many species restricted to misty mountainsides to extinction. The researchers said they had implicated widespread warming, as opposed to local variations in temperature or other conditions affecting the frogs, by finding that patterns of fungus outbreaks and species loss in widely dispersed patches of habitat were synchronized in a way that was statistically impossible to explain by chance. Climate scientists have already linked most of the recent rise in the earth's average temperature to the buildup of greenhouse emissions from smokestacks and tailpipes. Thus the new findings, according to the researchers and some independent experts on amphibians, imply that warming driven by human activity may have already fostered outbreaks of disease and imperiled species with restricted habitats. The study, led by J. Alan Pounds, the resident biologist at the Monteverde Cloud Forest Preserve in Costa Rica, is to be published on Thursday in the journal Nature. In an accompanying commentary, two scientists not involved in the research, Andy Dobson, a Princeton University ecologist, and Andrew R. Blaustein, a zoologist at Oregon State University, said the research provided "compelling evidence" that warming caused by human activity was already disrupting ecology. "The frogs are sending an alarm call to all concerned about the future of biodiversity and the need to protect the greatest of all open-access resources -- the atmosphere," they wrote. But other climate and amphibian experts criticized the paper, saying there were several layers of significant uncertainty that were not eliminated by the analysis. Among those, they said, it is still unclear whether the lethal fungus, which attacks amphibian skin, has long been in the affected areas and dormant or is a recent arrival. Some amphibian and climate experts who read the paper said it contained definitive statements - like "our study sheds light on the amphibian-decline mystery by showing that large-scale warming is a key factor" - that were not supported by data. Over 110 species of brightly colored harlequin frogs, in the genus Atelopus, once lived near streams in the American tropics, but about two-thirds of them have vanished since the 1980's. Implicated in many of those vanishings, as well as amphibian die-offs around the world, is a chytrid fungus that grows on amphibian skin from deserts to lowland tropical forests to mountainsides. A paradox confronting biologists studying possible links to climate change is that the fungus thrives best in cooler conditions, challenging the theory that warming is contributing to the amphibian declines. But Dr. Pounds and his team, in studying trends in temperature and disease around the American tropics and, in particular detail, in the cloud-shrouded ridges of Costa Rica where he lives and works, found patterns that they say explain the situation. Rising cloudiness, a long-projected consequence as warming increases evaporation, can keep days cooler by blocking some sunlight and nights warmer by holding in some heat. At intermediate elevations on the mountain slopes of places like Costa Rica, that could have created a favorable zone for the spread of the chytrid fungus, Dr. Pounds said in an interview. He said that because the apparent harlequin frog extinctions have occurred in lockstep in widely dispersed field sites, they are hard to attribute to anything other than the broad warming trend linked by other scientists to rising concentrations of greenhouse gases. While the fungus is the bullet, he said, the broader ongoing warming and resulting shifts in clouds are the trigger. Cynthia Carey, an expert in amphibian diseases who teaches at the University of Colorado, Boulder, said that while both climate and amphibian die-offs are serious problems, this particular paper failed to offer anything beyond circumstantial evidence of links between the fungal illness and warming. "It is difficult to prove cause and effect on the ground where multiple factors interact in complex ways," Dr. Carey said.